There are more sounds coming out of the Oregon woods than the cry of ‘Timber’, or the ripp of a power saw. Listen, and you’re sure to hear the gutsy gusto of part-time logger Buzz Martin. Buzz has captured-much of the magic of the tall timber and a great deal of the humor of the men who work in the Oregon woods. Buzz Martin has got to be Oregon’s answer to Grandpa Jones. If your toe doesn’t tap when you listen to this album, then friend, you don’t have one. Buzz writes and sings songs about the things he knows and understands. While in his early teens, he went to live with his older sister Nellie and her husband Bill Woosley. They lived in the 5 Rivers Country between Alsea and Waldport, Oregon. Their ranch is 36 miles from any town and it was there that Buzz really started playing quite a bit of music. Buzz used to join the Woosley Boys, Louie on accordian, Frank on mandolin, John on guitar, and Bill Woosley on any darned thing you hand him. When he was 18, Buzz went to work in the woods as a whistle punk. He worked at every job there is from cutting timber to high climbing. During his tenure in the woods, Buzz has worked every kind of machine from a cat to a giant LeTourneau*. Musically, Buzz got his first break from Buddy Simmons on his Channel 2 Hoedown TV in Portland. Buzz sang ‘Whistle Punk Pete’ and ‘Sick of Settin’ Chokers’ on the TV show. They got such good response that Buddy helped him record them. These records helped introduce Buzz to many fans throughout the country. With the expert arrangements from Bobby Gibson and the feeling for the songs from Buzz Martin, grab hold of your rocking chair, or whatever you’re sitting in to listen to this album, and be prepared for some fun. 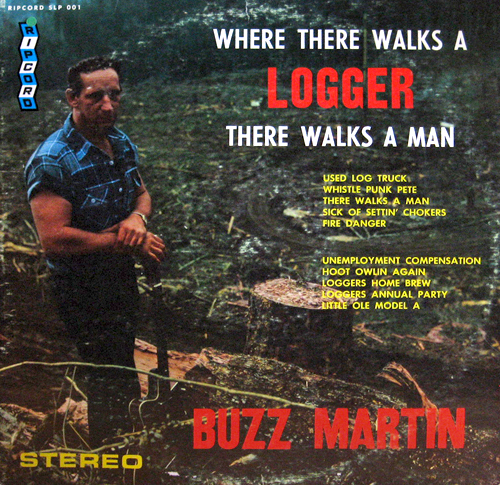 Some of my favorites are ‘Sick of Settin’ Chokers,’ ‘Loggers Home Brew,’ ‘Used Log Truck’ and ‘Fire Danger.’ I don’t think the Forest Service boys get such a large charge out of ‘Fire Danger,’ but what the heck, it’s just good clean fun – Buzz Martin style. Yes Sir, ‘There Walks A Man,’ and he knows what he’s singin’ about. Drop a needle on this … gently now . . . and meet Buzz Martin. He’s the fellow with a pen in one hand and an ax in the other. * That’s a log Stacker. Buzz told me what it was. Hell man, I’m a radio announcer. I wouldn’t know a LeTourneau from a shrunken Chet Atkins guitar pick. Recorded at Gibson Recording Studio, Vancouver, Washington, using Ampex AG 440.8 and AG 440-4 recorders, Neumann and RCA microphone systems, and a Langevin 12 channel mixing console. Produced by Bob Gibson and Rick Keefer. Awww yeah… Humorous, sometimes hilarious and always dead-on lyrics, all about working in the woods. In the movie Sometimes a Great Notion there is a bar scene where ‘Sick of Settin’ Chokers’ is playing in the background, a different version than is on this album but I think it’s still Buzz singing, and somehow it wound up uncredited in the film credits. I played college football at the University of Puget Sound — the Loggers, of course — in the late ’70s and early ’80s. Our coach had found this album somewhere, and he or the upperclassmen played it on an old phonograph in the locker room after every practice. When I was a freshman and first heard Buzz Martin, I thought, “What the hell is •this•?? ?” Within a year, I knew most of the songs by heart. And I can still sing a number of them from memory, 35 years later.